Micro Machines is a line of miniature toys originally made by Galoob (now part of Hasbro) in the late 1980’s and throughout the 1990’s. Micro Machines were literally that a tiny scale component style “playsets” and vehicles at an average length of 1.5 inches. The Micromachines toy range spawned a range of computer and video games on several formats including Amiga, Mega Drive/Genesis, Game Boy and PS2. In the Micro Machines games, racers typically race toy cars around home-made courses, such as Dad’s desktop or Mom’s kitchen, each with its own obstacles instead of Formula 1 car. 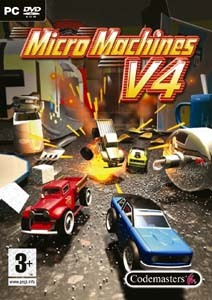 Micro Machines V4 is the newest installment to the game series by Codemasters and available on PlayStation 2, PC, PSP, and Nintendo DS. BoomTown (dead link) reviews Micro Machines V4 and concludes with rating of 6 out of 10 that if you’re willing to ignore Star Force, willing to ignore the dull single player mode, the complete lack of charm and character and the difficulty of unlocking all vehicles then there is fun to be had here if you’ll make good use of the multiplayer modes. It could have been much better, but it proves that the concept still works and hopefully another sequel will be along to refine the numerous problems with this one and prove Micro Machines still is one of the best series of all time.